This is the time of year that delights children from all around the world, and it is always a fun occasion whatever your age, and a good excuse for a party. Send out party invites with black cats, bats and witches on the front. Get the kids involved in making them if it is for a childrens party and let them send them out to their friends. Dress up yourself, the kids and the house to create that dark look that creates the atmosphere for your party. Make the food that will accompany the ocasssion too but keep it simple to save yourself extra work after all you want to enjoy the time also. 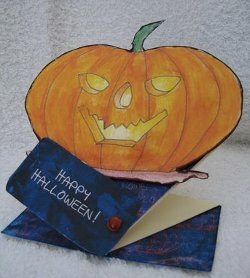 Buy the pumpkin to make that lantern and send out the cards to match the occasion. This Spring Fold Card was easy to do but you may find it helpful to use a template or a Scoring Board if you have one. All the measuring is done for you then. But just in case you don't have one the written instructions for you to get this unusual card are here Spring fold cards. It looks more complicated than it is so don't let it put you off. Once you have got the hang of the fold then have fun, it is ideal for any occasion, and imagine the recipients surprise when they open the envelope and this unusual card pops out. For another shaped idea, for any kind of card, try the stand up cards, and dress it up for the event you have in mind.